The luff is 550 mast plus 15 or 17.5 Mast Ext and boom 250. I use a GUNSAILS 550 Select. ​The morning after the regatta I wake at in The Sea Captains Quarters, our home for the last five days with my St George SC team mates and check my trinkets that I was awarded last night at presentation. I cannot believe it, after the tough first day I now am extremely satisfied with 2nd in the Australian title. There would have been about half a dozen sailors coming to this regatta with first place as the goal. I was one of those. I drove up late as possible, my body aching and with swollen glands I was trying to talk positively to myself but knowing the light winds forecasted I was having trouble convincing myself this regatta would be a good one for me. 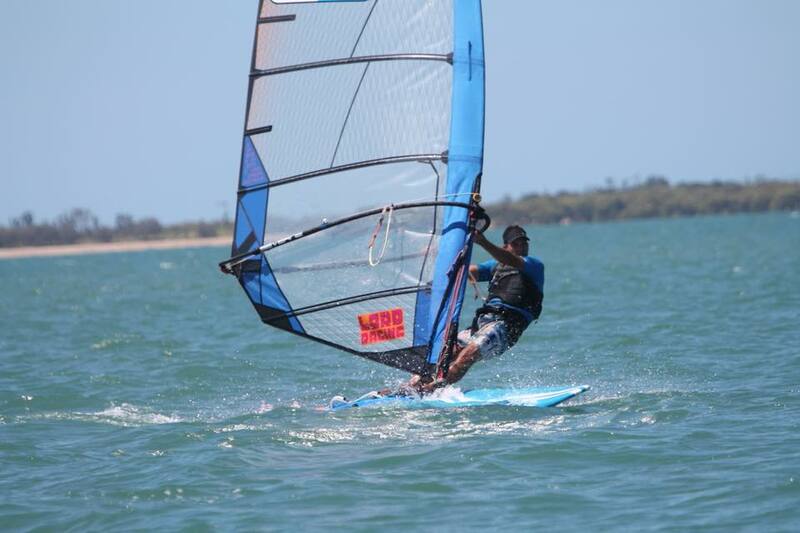 I always imagined it would be windy this time of year on Moreton Bay. I didn’t really watch my weight too much. I felt fit but I was eating too much food over the holidays. I weighed in on the regatta scales over 92kg pretty much as heavy as I get. The first day is lighter winds and a bit choppy. I find myself the most left of right sailor on the course too often. I am searching for some change in wind angle to give me the advantage but this never works every time. That night I have to face facts, this regatta is for the hill climbers to use a cycling term. Is there some other goal I can strive for? Richie Reynolds and Mark Ward are my age group but they are lighter and they are flying. James Grunfelder is my weight group and so I make my goal the Heavy Weight Title. James has had a pretty good day the first day much better than me, he has a explosive power at the start line and is always a strong finisher his board handling is second to none as well. I roll into day two and much the same as the first day. 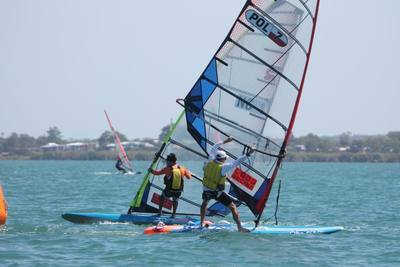 A leading group of 6 sailors are consistently placing, I am with them but at the back in 6th place. Maybe I need to relax about the result now and enjoy the company of the other competitors. I am staying with Jorn and for the first time Conor from my club. They are both in fine spirits, Conor tells some funny stories, we are always laughing in the house. Conor is sailing great too which helps lift the mood in the house. Staying with the boys makes the trip up all worth while. St George SC is a great club we even have matching shirts organised by our class captain Keith Single. 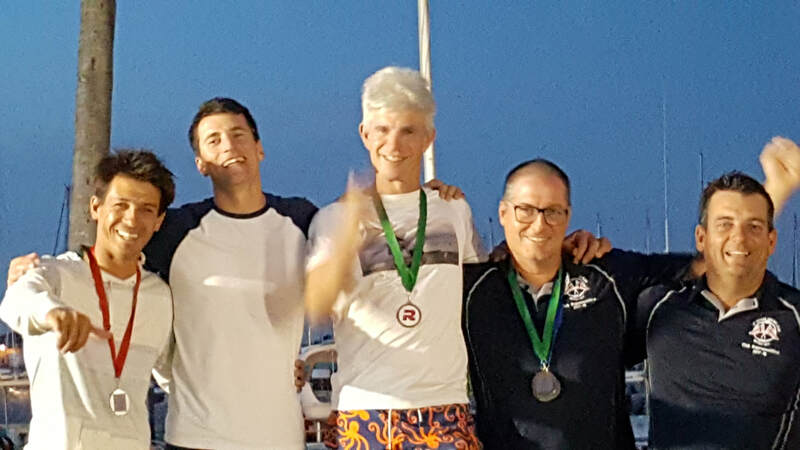 Keith like Conor is also having a great regatta and is looking good for his age group. Day three is light winds, definitely non planning and so it is announce at briefing 3 races only. We pump our sails continuously in light winds only hooking into the harness when it becomes too much to bear. I actually reckon marginal planning is the hardest; it is more anaerobic as oppose to aerobic. I need to have a good day if I’m serious about beating James for the heavy weight. I pump hard all day and I have always been pretty good at viable winds. 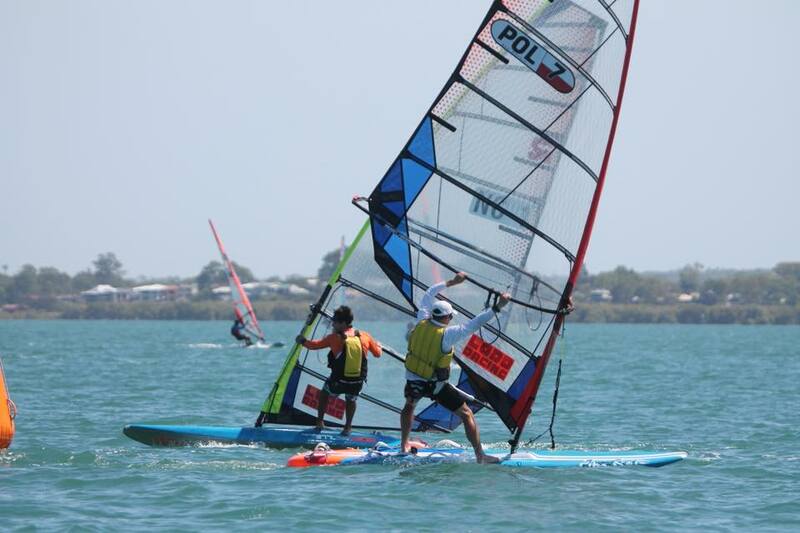 Polish sailor and 5 times World Champ Max Wojick sails with us this day. 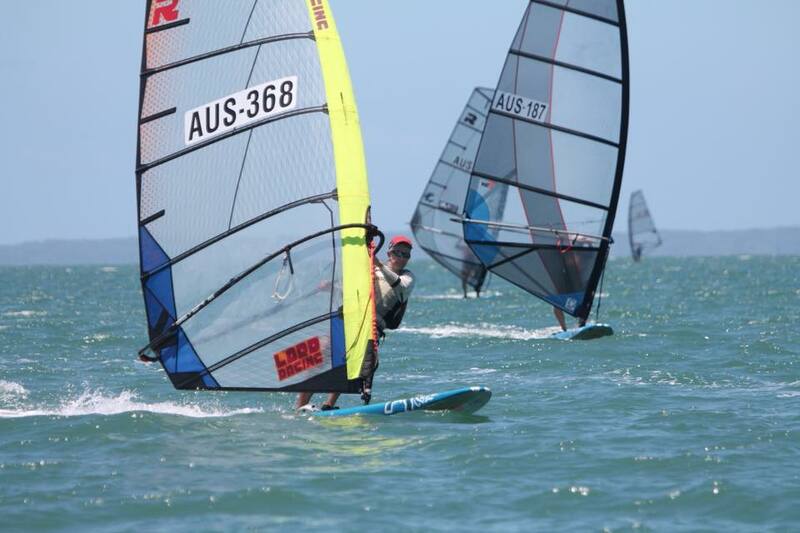 Max is employ by Sailing Australia as our Olympic Coach and is also tasks with rebooting youth windsurfing. Max wins the first two races BOOM! Max snares some debris on his fin and super talent Alex Rouys sails by to win the last sail race of the day. Richie gets third in this race and I lug myself over for 4th!! 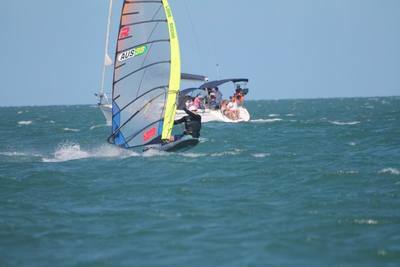 This race is my most proud moment because all four of us are using the sail I design and had manufactured, the LORD RACING. Day 4 I check the results and I have move up to 5th overall two points in front of James. It is a good position to be but I am worried if its enough. James has a habit of getting the job done, he is very competitive, he has that killer instinct. It looks windy and feels windy, windier than I thought it would be. 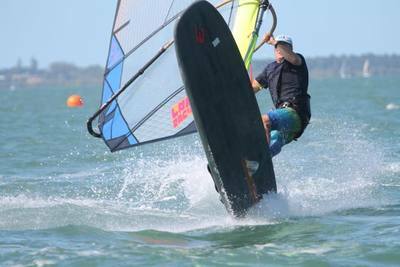 I find local legend Sean O’Brien who is winning the Formula regatta and ask his opinion on the wind. He says if it swings and comes off the shore it can have light patches. I decide to go out with the same set up I have had for the first three days. My full power set up. When I make it to the start line it is quite windy and I am hoping it doesn’t get any windier as I can barely sheet in upwind! We all start on Starboard tack and James is first to tack, I immediately go with him. I am flying upwind and get to the top mark first. I do three gybes downwind as it looks windier and flatter on the shore side, I go through the bottom gate still in front, James is right on me! It is intense and I am so glad I got through my gybes cleanly. We split tacks upwind. I don’t follow him as I think my way is OK and I don’t want to be doing a lot of tacks as it is getting a bit rough going. I go all the way to lay line and do one nervous tack and lay the mark. It is now clear I have gone the right way upwind and I sail downwind with one gybe at the lay line and pump down to the finish. In the end I win by a good distance. I am now three points in fronts of James. If I break something I will have to use my drop race of 6 points so I have to keep pushing on. 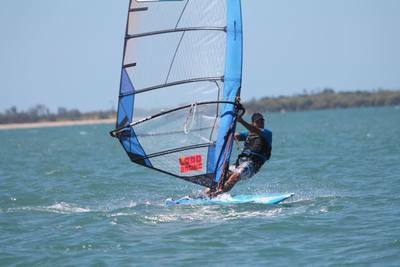 I now know my speed in the conditions is extremely good and decide to sail very conservative with minimal tacks and gybes and over laying everymark to avoid any double tacks or gybes at the marks or gate. 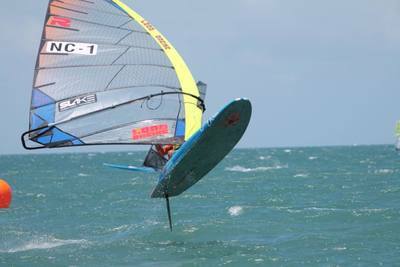 I win the next race and then during the lunch break I change my to my stiff battens and small fin with Jorn’s help. I am lucky Jorn has retired from ripping of his big toenail sailing and so is able to help get the job done in the blusterer conditions. I win the third race of the day and James gets third place in this heat. If my sums are correct I have now the heavy weight division, even if James wins and I break something in the last heat. James and I didn’t come here for the heavyweight division we both wanted the overall but now I feel super to have won it against a true warrior. I go out in the last race relaxed and to enjoy the race. Sailing the board with the stiff battens is joyful. I win this race and second is Alex Rouys, in fact he has got second in the last three. This is quite amazing as his weigh in was 68kg (more than 24kg lighter than me). He set his Lord Racing sail with a softer top mast section and it layed of nicely. For my weight I will stick with a more constant curve type of mast. Alex Rouys is second on the Oceanic points a great result. Cam Harrison won the regatta. On the first day he got three first places and then a stack of second places. I admire this score sheet as I think it shows maturity to place yourself not on the edges of the fleet and not over do the pumping in one heat at the expense of the next heat but rather a patient consistent effort. Six sailors won heats so I would say a very competitive fleet. To improve my performance, to move up the general classification I need to be definitely be lighter on the scales firstly. I also need to do marginal planning downwind much better. I was the only guy using the Exocet RS 380Elite and it is pretty obvious to me on how to improve this board without detracting from its already good points. Next job is to make and register a LORD RACING hull. 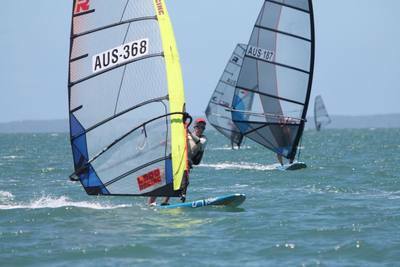 For the regatta I would like to thank the Queensland Windsurfing including John O’Brien the race officer. Start line length, angle of the start line, distance to the first mark, location of course and these types of things are important to the competitiors so we thank John and his team. Also big thanks to the NSW crew and the millions of races we have all enjoyed and benefited from over the year. And thanks to St George SC we race hard but we also enjoy the days and usually have a quiet drink after the day.